When decorated soldier Captain Colter Stevens (Jake Gyllenhaal) wakes up in the body of an unknown man, he discovers he's part of a mission to find the bomber of a Chicago commuter train. In an assignment unlike any he's ever known, he learns he's part of a government experiment called the "Source Code," a program that enables him to cross over into another man's identity in the last 8 minutes of his life. With a second, much larger target threatening to kill millions in downtown Chicago, Colter re-lives the incident over and over again, gathering clues each time, until he can solve the mystery of who is behind the bombs and prevent the next attack. 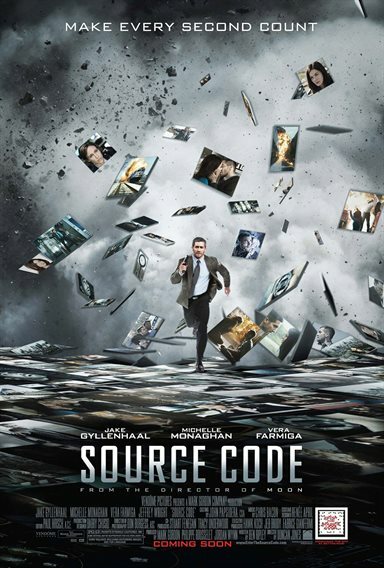 Filled with mind-boggling twists and heart-pounding suspense, Source Code is a smart action-thriller directed by Duncan Jones (Moon) also starring Michelle Monaghan (Eagle Eye, Due Date), Vera Farmiga (Up in the Air, The Departed), and Jeffrey Wright (Quantum of Solace, Syriana). Download Source Code in Digital HD from the iTunes store. Source Code images are © Summit Entertainment. All Rights Reserved. Source Code stars Jake Gyllenhaal as Captain Colter Stevens, an army helicopter pilot who has been recruited by a covert government agency to assist in tracking down a terrorist who bombed a commuter train earlier that day and now plans on expanding his destruction by wiping out Chicago. The trick with this film is that Captain Stevens is being sent back in time through a vaguely explained scientific theory which allows him to inhabit the mind of one of the passengers on that train. Because of an "echo effect" he can only inhabit the last eight minutes of this man's life. When he reaches the point where the bomb goes off, Stevens is transported back to the facility where this experiment is taking place. At the opening of the film Stevens awakens on the train with no memory of how he got there. He does his best to try and figure out how he got there but to no avail. At the end of the eight minutes the bomb goes off and Stevens awakens inside a dark metal capsule, again with no recollection of how he got there. A liaison by the name of Colleen Goodwin tries to help Colter recall his mission. Once again they send him back to the train where he relives the same eight minutes until the bomb goes off. This time certain events seem different but overall it is the same timeline. He is still unable to locate the bomb or the bomber and returns to the capsule. Becoming more agitated by the lack of information given to him he finally receives an explanation on how he is able to go back in time. Dr. Rutledge (Jeffrey Wright) explains that even after death there is an echo left by a person's mind. Their facility allows for a person to sync with that echo to live the last few moments of a person's life. This comes in handy for trying to prevent threats to the public. As time grows short and the time of the bomber's next attack draws closer Captain Stevens is sent back multiple times finally allowing him to not only find the bomb but also identify the bomber. Successfully completing his mission you would think that would be the conclusion of the film. But this is where things become more interesting. Instead of going with an intense action packed final sequence where every second counts and there are multiple obstacles in their way, the film rather aims for a softer and more poignant conclusion. To explain exactly what happens would be unfair to anyone who has yet to see it, but suffice it to say it makes the film worth the experience. Had they gone with a big Hollywood ending the movie probably still would have done well over opening weekend but this small twist at the finale allows for the audience to connect and relate even more with the main character. Overall, Source Code, like any science fiction film, contains certain plot holes which don't allow for any basis in reality but who needs every movie to be exactly like the lives we live. If that were so then we wouldn't need movies, we would just live our lives never imagining anything more than what we have. But this type of movie, like all others, allow us to step outside our shoes for a short while and wonder what life would be like in someone else's. 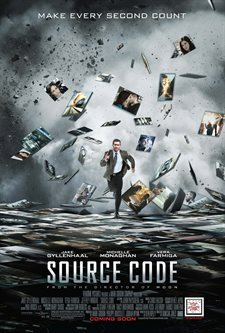 So if you're planning on seeing a film this weekend, definitely go check out Source Code, it is a fun ride with a good story and solid performance from Gyllenhaal who has proven to be more than just a pretty face.